There are multiple motivational stories we all are familiar with, but there are some which despite being little – known can touch the deepest part of our soul. Actor Chitrangada Singh, who has produced Soorma, says biopics should be narrated truthfully with the success of Bhaag Milkha Bhaag, MS Dhoni: The untold story and Dangal among others, Biopics on sports starts have become the newest flavour in Bollywood. Director Shad Ali’s all – White hair should in no way be an indication of his age. Rather, it should be an indicator of the time he has spent in the industry. Shad has now opted for a real – life drama with Soorma. The film – based on former India Hockey Captain Sandeep Singh – tells an inspirational story about his miraculous comeback in the game after being accidentally shot at and seriously injured on board the New Delhi – bound Kalka – Delhi Shatabadi Express in 2006. Singh was almost paralysed and on a wheelchair for two years after the tragic incident. Soorma released in Pakistan today and has been reportedly occupying 80% of the Pakistani screens. It will also release in Kuwait on Thursday without any cuts or modifications.Director Shad Ali shared, “This movie is not restricted to Indian Audience but people across the world will get inspired by Sandeep’s stroy. It is an inspiring story that recalls one chapter of our nation’s success in the field of Hockey. “Ninety per cent of the film is true, just 10 per cent is not because we couldn’t take name of certain people and we couldn’t get some permissions.There is no Fake incident that has been created, it is real,” she added. So, if you’re expecting the kind of inspiration from soorma that you did from Chak De India, best not to see this film. 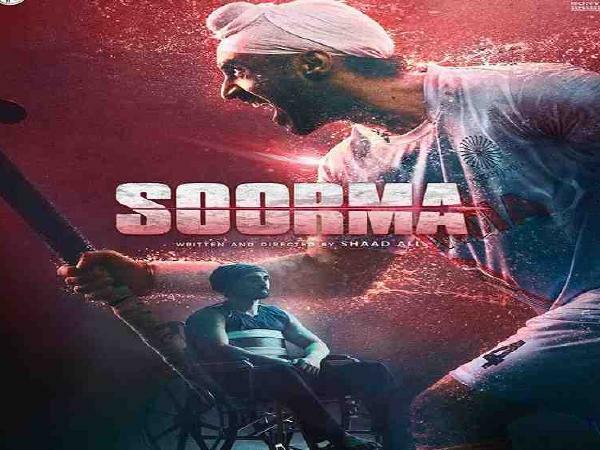 Soorma is more about botched love story between Sandeep (Dosanjh) and his girlfriend, played by Taapsee Pannu. Soorma is more a drag than a flick. It is a shame because this was Bollywood’s chance to regale the Audience with an inspiring story of a sportsman, whose return to Hockey after a life – threatening incident was nothing loss than miraculous. A champion is turned into a colourless Bollywood hero.